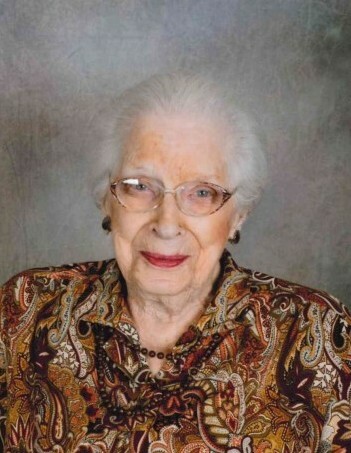 Louise Janzen, age 98, passed away Friday, August 31, 2018, at Marion. She was born October 1, 1919, at Roxbury, Kansas, the daughter of Charles and Elizabeth Smith Anderson. She later graduated from Peabody High School in 1936. In 1939 she was married to W.H. “Bill” Janzen. They farmed in the Florence area for a number of years. Louise was hired by the Marion County Welfare Department in 1970 and later was a State Welfare Department employee. She moved to Marion in 1983 and retired from social services in 1985 after 24 years. Louise was active on church committees serving on the church board, youth leader and Sunday School Superintendent at Florence Christian Church. She originated the Jayhawk 4-H Club where she was a Community Leader for 15 years and Project Leader for five years. Louise was also a member on the Marion County Extension Council. Louise loved camping and traveling including a trip to Alaska in1998, the Rose Parade in 2000, and many camping trips to Canada. She was preceded in death by her husband Bill in 2011. She is survived by Son Ed Janzen of Fargo, North Dakota; daughters Jean Knoll of Wichita, Kansas; Donna and husband Randy Linaman of Poulsbo, Washington; Seven grandchildren, sixteen great-grandchildren, and one great-great-grandchild. The funeral will be 11:00 a.m. Wednesday, September 5, 2018, at the Marion Christian Church, Interment will follow at the Marion Cemetery.